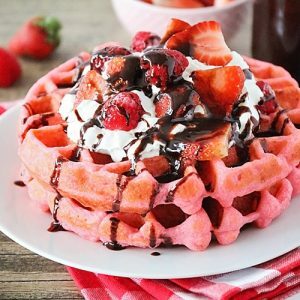 These homemade pink velvet waffles are everything you need in a Valentine's Day Breakfast - they're easy, they're festive, and they're super delicious, too! In a large bowl, whisk together the flour, baking powder, sugar, and salt. In a medium bowl, whisk together the butter, buttermilk, vanilla, eggs, and food coloring. Pour the wet ingredients into the dry ingredients, and stir until just combined (small lumps are okay). Let sit 5-10 minutes. While the batter is resting, heat your waffle iron. Add the batter and cook according to the waffle maker's directions. (For my waffle iron, 1 cup of batter cooked for four minutes was perfect.) Serve hot, topped with chocolate syrup, fresh berries, and whipped cream.